Watermarx Graphics have been getting into the swing of things with our wonderful clients from the fashion, interiors and designer homewares industry. Letterpress and embossing has always been a favourite of fashionistas but the label love has never been as strong as it is this year. Apparel and home ware designers are demanding their swing tags carry through with the uniqueness of the brand, conveying through beautiful printing a particular “feel” that expresses their intention. The swing tag is part of the shopping experience – sending a very specific brand message. It’s a designer’s calling card and will work to imprint an impression on the customer’s mind. Do you want to send a simple, eco message? Or will your clients be seeking opulence and decadence? Some fashion brands need funky foiling others require luxurious letterpress, some styles are suited to luscious cotton stock with a prominent emboss, whereas other designs demand edgy kraft stock but each embellishment can help to capture the very essence of a brand’s heritage, something we love to be part of here. Agrestic-inspired motifs seem to be popular with swing tags this season. We recently printed Ellie Aitken’s swing tags whose brand Aitken & Co provides classic, beautifully made clothes and accessories. She elected for an elegantly embossed motif with a classic, letterpressed typeface and a two-tone effect (the front was left white, the back of the tag a letterpress printed solid silver). Manyara Home, a designer homewares label, asked us to blind emboss a gorgeous wreath on their swing tags last month. Both jobs turned out beautifully. The popularity of our letterpressed, die-cut and embossed swing tags has slipped from the fashion world into regular life too. A new and fun way to attach a message to goody bags at events, corporate gifts or wedding thank yous; they are event becoming a part of people’s personal stationery requests. The year is already off to a flying start. Did you just see that water snake wriggle past – phew – happy Chinese New Year, already! But more importantly, we’re in the mood for love here at Watermarx this week, with Valentine’s Day just a heartbeat away. We’ve been letterpress printing, embossing and foil stamping away since the new year creating unforgettable expressions of love with wedding invitations. Ø Whimsical typography – Grand declarations of undying love are best is sweeping lettering and bedizened with swirling flourishes. Choose a romantic phrase such as a song lyric, line of poetry or even something you have penned yourself to pour your heart out. A typeface like Woodtype Ornaments or similar will give you a lot of tools to begin with but expect to be fiddling around for hours, modifying your design to create the perfect statement. Get swept away with sweeping statements, caught by well-kerned confessions and tangled up in dreamy declarations with the timelessness of these fancy fonts and flourishes. 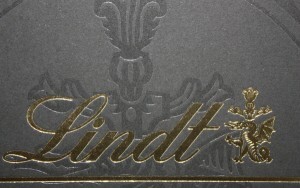 A3 posters, embossing/debossing, letterpress or foiling. Ø Quaint & Corny – Make your lover laugh. Captures the light-heartedness of courtship and romance with a dash of the soppy, silly or just darn cute. Simplicity is the secret to success here. 1- or 2- (punchy) colour designs, simple line drawings and a delightful stock (with sweet trimmings such as envelopes and bakers twine) will let your message burst through like a cupid’s arrow to the heart. The best thing about this approach is that you don’t even need to come up with an original message, you just need to apply an original or funny treatment to your visual take on it. Be irreverent, poke fun (gently) and make your loved one LOL (oh dear, yes we just went there). Particularly good for love notes are typewriter-style or handwriting inspired typefaces. The most important thing to remember is to select a paper stick that conveys tactility and (gasp!) touch. Of course, it depends on the recipient of your expressions of endearment (choose something to suit their personality) but choose something beautiful like layered rice paper stock or a thick and textured uncoated stock that suggests the unrestrained, natural and imperfect… because after all, isn’t that what love it all about?